Character creation process, setting info, maps, and RULES are located here. Natural 1: The GM will ALWAYS make things interesting. A natural 1 is an automatic miss at any range. YOU CAN NEVER DODGE A VOLLEY OF 4+ MISSILES--Shoot 'em down! Mini-Missiles are not guided missiles and so the above rule does not apply to them. GMs are encouraged to apply a substantial dodge penalty (of their own reckoning) nonetheless. Laser targeting bonuses are not cumulative. Bionic hands will negate any bonuses received from custom weapons grips. Pure Offense: using both weapons on the offensive PCs get only straight attack rolls with applicable bonuses if any. No dodging or parrying is possible. 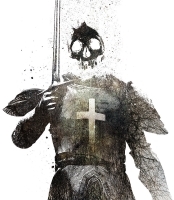 Pure Defense: parrying & dodging more than three melee attackers is only possible in this mode. Each parry or dodge costs an action. Balanced strategy: Enables one weapon-arm to parry while the other is used to strike. Any dodges used in this fashion costs both 1 offensive and 1 defensive action. Cannot defend/engage against more than 3 opponents at the same time. Each parry and each strike costs an action from the designated weapon-arm. Power Attacks cost the offensive weapon-arm 2 attacks and Called Melee Strikes cost 2 attacks. Specialized actions such as disarm, restrained attack, entangle, are usable in the modes befitting the action. Ergo, no restrained attack when you're in Pure Defense. Melee called strikes will never have a strike penalty but they will still take two melee actions. However, only really small stuff will require a called shot/strike. For example, while it may be tough to hit someone's head with a ranged weapon, it wouldn't make that much difference for a melee fighter, so it would just be a normal strike sent at the head. You specify your target, take one action to strike it, and so on. Tiny stuff that would be hard to hit even up close and personal (like weapons) requires a called strike. PP bonuses apply to ALL melee combat moves. Strike bonuses from HtH or from OCC powers or other sources do NOT apply to special moves such as disarm, hold, etcetera, only bonuses that specifically apply to those moves and PP bonuses. "Magic attacks per melee" as per normal Palladium rules is hereby dissolved. Actions per melee applies to all types of actions so a mage may mix his spell casting with other actions as he sees fit. All magic spells levels 1-4 take 1 action to cast. All magic spells levels 5-8 take 2 actions to cast. All magic spells levels 9-12 take 3 actions to cast. All magic spells levels 13-15 take 4 actions to cast. Any spell of legend requires at least a full melee to cast, likely much longer. All normal rules regarding rituals apply (they're time-consuming). Being Near a Ley line, within two miles, increases the range and duration of spells by 50%. Being at/on a ley line OR one mile from a nexus point doubles the range, duration, and damage of magic spells. The Mage can also draw an additional 20 P.P.E. (Double for LLW & LLR) per level every 15 seconds. Magic spells and effects (damage, range and duration) are doubled. Plus his own P.P.E. recovers at the increased rate of 10 P.P.E. per 1/2 hour, without meditation. Being at a ley line nexus point or within 200 feet of a nexus point triples the range, duration, and damage of magic spells. The Mage can draw upon 30 P.P.E. (Double for LLW & LLR) per level every 15 seconds. The mage gets a +2 to save vs magic and HF. Spell Strength is +1. P.P.E. Recovery Rate is 20 per 1/2 hour without meditation. Periods of Increased energy at a nexus point. IAW RUE. Captured P.P.E. Limit: 3x Normal P.P.E. Time Limit: PE in hours+ 1 hour every two levels. Damage and range is increased by 50% when within 1/2 mile of a ley line. Damage and range is doubled when on a ley line or nexus. Range and duration of psionic powers is doubled when at or near a Ley Line or Nexus point. Psychics can draw on 1D6+level number (of player) every melee round when on a ley line. 2D6+level (number of player) if on a ley line nexus. But must be used during that same melee. Psionic attacks that do physical damage get a +1D6 damage bonus when on a ley line; +2D6 damage bonus if on a ley line nexus. Century Station Note: Magic Energy is WEAK on this world. Still, Ley Lines and Nexus points may be encountered at some point. Last edited by Augur on Wed Nov 05, 2008 5:39 pm, edited 1 time in total. Aliens Unlimited, P. 23 wrote: Robotic armor ratings work the same way as vehicle armor and natural armor. Any rolls to strike that are below the armor rating simply bounce off the robot, while those that are above it do damage to the robot's S.D.C. (not the pilot). The pilot is not in danger until the robot's entire S.D.C. is depleted. This is a direct contradiction of all standing rules present in HU2 and even in the older Revised HU. Because I just discovered it and it blows my mind! Also, because I have decided to make this applicable to Robotic Exoskeletons and fully enveloping body armors of all types. Ergo, if you are wearing an Omega Suit, this does not apply to you. The Omega Suit is not armor per se, it's a highly protective costume/uniform. If you are wearing a suit of Class 4 Hard Armor along with an attached helmet, it does apply. UFO investigation operations is what Project Tyche was originally created for by the United States Air Force and it can trace its roots all the way back to the mid-20th century Roswell Incident. The Project's purpose is to protect citizens of the burgeoning Northern Alliance (USA, Canada, Mexico) from hostile aliens. A number of alien technologies have been acquired by Project Tyche as well and this is their less-than-public mission as well. Project Tyche is more likely than their brother organization to assume hostile intent and "eliminate" aliens that appear to pose a threat. Project Secure is a cross-agency affiliation between the CIA, FBI and NSA. Project Secure does "clean-up" and "containment" of sites where alien contact and materials have been present. Any physical specimen of alien technology is secured, cataloged and removed to a secret location for further study and analysis--living aliens are no exception to this policy though are treated with due care and kindness. SHOCK is an alien watch group and veritable army of human purist who operate as a political organization. They are proponents of "natural man" and view any person that doesn't fit their bill as a threat to humanity. SHOCK is a well-funded and politically well-connected group who lobbies for strict laws against the inhuman elements of society and commits acts of terrorism and genocide whenever the situation presents itself and they can make themselves look like the protectors and defenders of human rights. An urban legend and scary rumor among a few members of the Mutant Underground is the MTF. Very little is known of this shadowy group save for that they make mutants disappear. Most who have heard of the MTF laugh uneasily and chalk them up as a contemporary version of the 20th Century's "Men In Black." Word abounds of a Mutant Underground which helps runaway mutants escape the recovery teams sent after them by their creators and helps find safe haven for mutants being persecuted in their communities. These agencies are national in origin and are tasked with controlling elements of superbeing activity. Capture, control, monitoring, elimination and retrieval of superbeings by the government with the help of intelligence agencies, police and military forces is the purpose of these very-well funded and government-sponsored teams. The premiere inventor and manufacturer of ultra high-tech equipment available on the black market is the elusive Fabricators Inc. Catering to underworld criminal organizations, syndicates, and supervillains, Fabricators Inc. trades high-tech equipment, weapons and armor in exchange for "favors" and huge sums of money. Until the Daedalus Project's collapse at Century Station and the subsequent proliferation of high-tech gear from the collapse, they were the only game in town for reliable, high-tech criminal gimmicks and gear. The globe is wracked with conflict as the planet goes through a painful transition from the colonial era to the modern era. The United States of America sees its first de facto dictator with the election of its 28th President, Woodrow Wilson (1913-1921). Individual liberty is crushed as "progressive" reforms such as the Draft, Income Tax, and Prohibition become Constitutional amendments. Women's Suffrage is also enacted as a Constitutional amendment with wide support. The plight of blacks in the country under Jim Crow laws supported by the President and likeminded Progressive "dixiecrats" effectively lead to the wholesale disenfranchisement, abuse and murder of many black Americans. Unusual and seemingly superhuman feats are reported happening during battle across the globe during this period but none are substantiated and interest remains minimal. A worldwide economic collapse triggers widespread famine and small scale conflicts. Tensions grow in Western Europe as the German nation struggles under the strain placed upon it due to the Treaty of Versailles and the industrialized nations of the world compete for resources. In Los Angeles, California, 1931, the first confirmed report of a mutant human is entered into the record of the Office of Strategic Services (OSS). The mutant was discovered through simple employment records which brought to light his true date of birth and origins after some investigation. Arthur Humphries had been born to a wealthy family of plantation owners in 1836 and was on record as having fought in the American Civil War (1861–1865) in the Confederate Army. The man looked to be in his mid 30's when captured. Thorough medical exams were conducted to verify his true age against his apparent age and proved his mutant origin. Records of this were deemed classified by the OSS and quietly buried. What happened to Arthur Humphries after he was taken into custody by the OSS remains a mystery and no further public record of him exists. In the aftermath of World War I, a defeated Germany signed the Treaty of Versailles. This caused Germany to lose a significant portion of its territory, prohibited the annexation of other states, limited the size of German armed forces and imposed massive reparations. Russia's civil war led to the creation of the Soviet Union which soon was under the control of Joseph Stalin. In Italy, Benito Mussolini seized power as a fascist dictator promising to create a "New Roman Empire." The ruling Kuomintang (KMT) party in China launched a unification campaign against rebelling warlords in the mid-1920s, but was soon embroiled in a civil war against its former Chinese communist allies. In 1931, an increasingly militaristic Japanese Empire, which had long sought influence in China as the first step of its right to rule Asia, used the Mukden Incident as justification to invade Manchuria; the two nations then fought several small conflicts until the Tanggu Truce in 1933. National Socialist Adolf Hitler became the leader of Germany in 1933 and soon began a massive rearming campaign. This worried France and the United Kingdom, who had lost much in the previous war, as well as Italy, which saw its territorial ambitions threatened by those of Germany. To secure its alliance, the French allowed Italy a free hand in Ethiopia, which Italy desired to conquer. The situation was aggravated in early 1935 when the Saarland was legally reunited with Germany and Hitler repudiated the Treaty of Versailles, speeding up remilitarization and introducing conscription. Hoping to contain Germany, the United Kingdom, France and Italy formed the Stresa Front. The Soviet Union, concerned due to Germany's goals of capturing vast areas of eastern Europe, concluded a treaty of mutual assistance with France. Before taking effect though, the Franco-Soviet pact was required to go through the bureaucracy of the League of Nations, rendering it essentially toothless and in June 1935, the United Kingdom made an independent naval agreement with Germany easing prior restrictions. The United States, concerned with events in Europe and Asia, passed the Neutrality Act in August. In October, Italy invaded Ethiopia, with Germany the only major European nation supporting her invasion. Italy then revoked objections to Germany's goal of making Austria a satellite state. In direct violation of the Versailles and Locarno treaties, Hitler remilitarized the Rhineland in March 1936. He received little response from other European powers. When the Spanish Civil War broke out in July, Hitler and Mussolini supported fascist Generalísimo Francisco Franco's nationalist forces in his civil war against the Soviet-supported Spanish Republic. Both sides used the conflict to test new weapons and methods of warfare and the nationalists would prove victorious in early 1939. With tensions mounting, efforts to strengthen or consolidate power were made. In October, Germany and Italy formed the Rome-Berlin Axis and a month later Germany and Japan, each believing communism and the Soviet Union in particular to be a threat, signed the Anti-Comintern Pact, which Italy would join in the following year. In China, the Kuomintang and communist forces agreed on a ceasefire to present a united front to oppose Japan. On September 1, 1939, Adolf Hitler launched his invasion of Poland and World War II broke out. As all these elements began to raise tensions in Europe and Asia, people with extraordinary abilities began to manifest. "Ununsual Occurences" regarding ordinary people displaying superhuman strength and physics-defying powers began to emerge in small numbers. Always on the cutting edge and never one to pass up a potential military technological edge, Hitler employed nearly a thousand German scientists to study these people as they appeared in Germany and lands annexed and conquered by the Fascist state. In America, as tensions grew and it became apparent that involvement, in what many isolationists believed was a "European matter," was inevitable the population of the United States and Canada began to see a dramatic rise in the number of these so-called "super-humans." Indeed, throughout World War 2, records exist substantiating around one hundred super-humans globally, forty-five percent of these appeared in the United States and fifteen percent in Canada respectively. Many historians and scientists hold different theories as to the cause of these surges in the appearance of superhumans and paranormal activity. Some suggest that periods of heightened sunspot and other solar-climatic activity bear a direct correlation in the rise of the paranormal and superhumans, other suggest the effect is from environmental conditions and pollutants, still others note the link between periods and regions where great stress is placed on the backs of the common population and that this may cause a "trigger" which activates either genetically hibernating super-genes or lowers the walls in the human mind and make accessible powers we all share but unconsciously repress. Regardless of the cause, nearly all such superbeings got involved in the conflict, often lending a hand at a critical point and turning the tide of battle in their side's favor. Certain heroes, such as the United Kingdom's Britannia became global icons of justice. The Cold War was the continuing state of conflict, tension and competition that existed primarily between the United States and the Soviet Union and those countries' respective allies from the mid-1940s to the early 1990s. Throughout this period, the conflict was expressed through military coalitions, espionage, weapons development, invasions, propaganda, and competitive technological development, which included the space race. The conflict included costly defense spending, a massive conventional and nuclear arms race, and numerous proxy wars. The population of known "super-humans" plummeted by the end of WW2 and through until the early 1960's as many of the superheroes from The Greatest Generation retired to lives of obscurity, died, or simply vanished. The era that saw the rise of the Civil Rights Movement also saw the first truly large scientific successes in the fields of BioTech, Eugenics, and Nuclear technology among a host of other, less radical advancements that generally improved the quality of life for most on the planet. This rise in technology and covert warfare between super-powers saw the use of numerous superbeings by the CIA, SIS (or M16), and KGB among others in espionage and those country's counter-intelligence efforts. Technology and Science replaced family and religion as the primary support and belief systems of most of the world's population during this period. From the first super-computers to the first bipedal robots was a matter of only thirty years for the technology sector. In the BioTech sector, the Human Genome was mapped and fully understood within twenty years and anthropomorphized animals became the latest controversy as the BioTech firms pushed the limits of human morality and science to the limits. The population of superhumans began to rise dramatically in the 1990's and continues to the present day. Today, it is believed that as many as 1 in 100,000 people may possess some level of mutant, psychic, or otherwise paranormal ability. Most of them seem to be centered in technologically advanced countries, speculation runs rampant as to reason behind this but science has no answer. The Age of the New God also saw a dramatic rise in super-crime as well as a rise in super villains and super heroes. Many critics argue that as both operate outside the law, they are all criminals and many attempts to legislate a Superhuman Containment agenda have been attempted, even one attempt at internment in P.O.W.-like camps. No such resolution thus far has gained enough support to become law. The formation of the North American Union (NAU) in 2027 by the former countries of Canada, Mexico, and the United States of America also saw the birth of the Northern Eagle Military Alliance (NEMA, still in its infancy) as well as the creation of S.C.R.E.T. 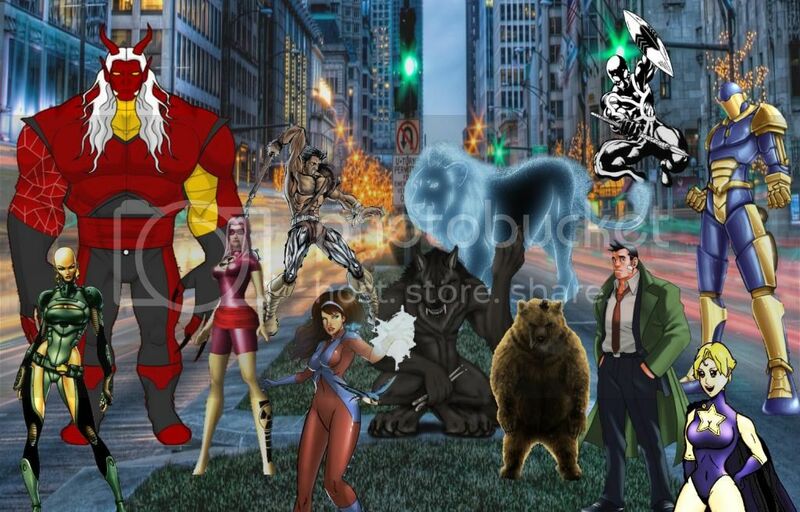 (Superbeing Control Recovery and Elimination Team) units in each member country using cutting edge technology and superbeings friendly to the NAU and NEMA. 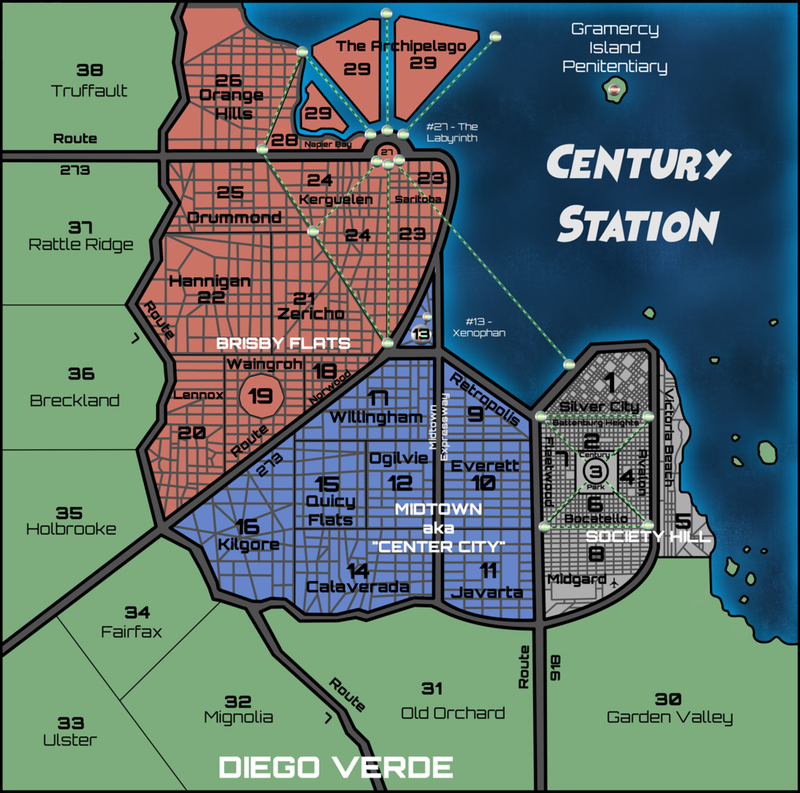 Project Daedalus was begun in 2041 as Cook County and Chicago was stripped of their original identity and made into their own federal district: Century Station. Century Station would be the hub of Project Daedalus, which promised to bring clean, limitless energy to the entire world, end world hunger, all diseases, and rise humanity to the stars. Project Daedalus was the grand undertaking to finally prove the superiority and infallibility of science which many hoped would prove the ultimate undoing of religion and other so-called "primitive" belief systems. The "Progressives" were now known as "Technologists" and sought to control people for their own good in hopes of perfecting people through science and the acquiring of knowledge. When, in 2041, Project Daedalus was yanked from the heart of Century Station by Galactic Law Enforcement officials, the economic and industrial heart of Century Station was ripped out along with the criminal mind behind the scheme. 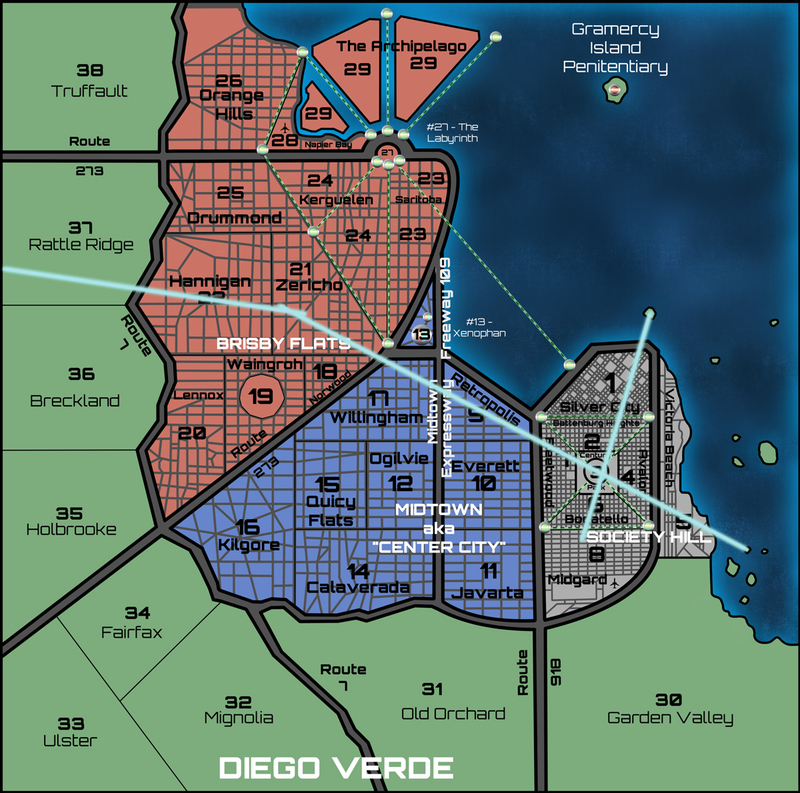 The Bloody Monday Riots happened shortly thereafter and the world's highest concentration of super villains and super heroes now reside in the Mega-city. Century Station has fallen so far, so fast that many believe it's only a matter of time before NEMA is called in to maintain order through Martial Law. Innumerable Legionnaries (independent and unsanctioned vigilantes) fight the tide of crime, oppression, despair and poverty but constantly have to watch their back for law enforcement as well. Cavaliers like the famous "Centurions" and the newly formed "Omegas" are able to act with a certain level of impunity but are still subject to scrutiny by the watchdogs and scandal-rag purveyors of the media. The Northern Eagle Military Alliance is in its infancy. The United States, Canada and Mexico are charter members. As of 2042, the three countries' alliance means that intelligence information is shared freely; S.C.R.E.T. teams from the three countries lend assistance to their neighbors in need and coordinate their actions together when cross-border super-criminals are involved; the militaries cross-train and coordinate their deployment schedules; the three countries have invested in the creation of a new pseudo-military peacekeeping and emergency-response force that does not answer to any one country but acts to provide services and render aid to any area in need that falls under NEMA's jurisdiction. Central & South America are still fractured areas of unrest and hotbeds of political and military strife. Australia is unaligned with any of the 21st Century's major power-blocks but is constant contention with the Pan-Asian Co-Prosperity Sphere for natural resources and political power. Tensions over many off-shore oil reserves are at the boiling point and military actions have been conducted in the recent past by both sides over these resources. Each bedroom, 1 to 7 and 9 to 18 are a spacious Fifteen foot by Twenty foot space. Including a bed, dresser, desk, computer, side table and alarm clock. Each bedroom has a small bathroom including a corner shower, toilet and sink. There are no bathtubs in the building anywhere. Bedroom 8 is for the main leader of the Omegas and is much larger. Each room has a lock on the door and each person has their own key into the rooms. 19: A general access hallway between the bedrooms (1 to 18), the Gym (20), and living area (32). 20: Full sized gym including free weights, sparing mats and boxing ring and other such training machines. Overhead is a oval shaped track for running with a small staircase leading to it. 21: A full sized pool with low and high diving boards for those that swim to keep in shape. 22: A full memorial hedge garden with statues of the fallen Omegas of the past to remind us of who died so that we may live. 23: (not marked but located in the upper left hand side of the garage) Elevator leading to the second floor hanger bay. Three helicopters reside within the hangerbay. One for each team. 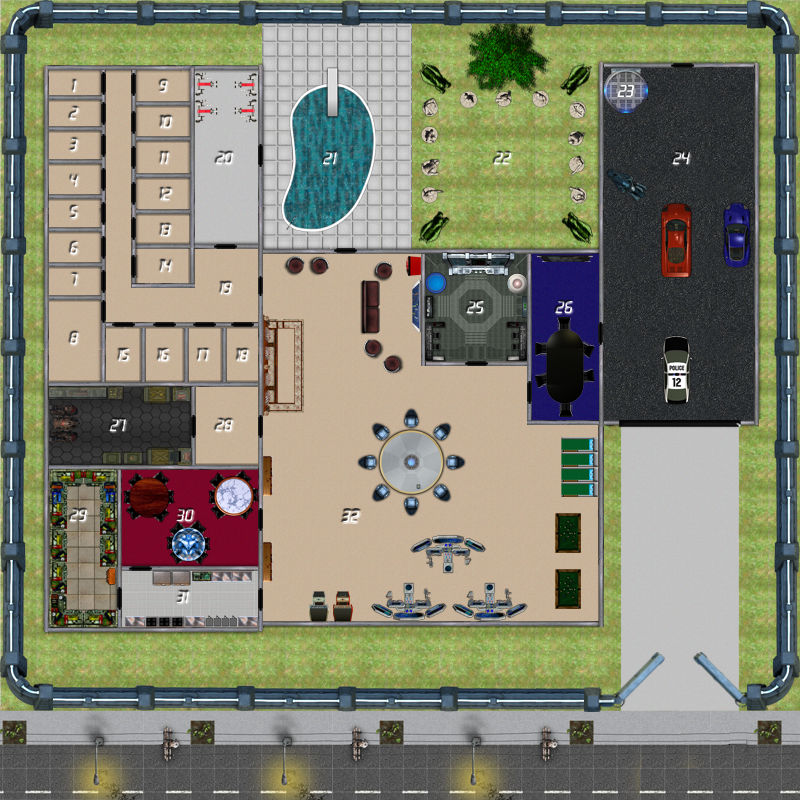 24: Large garage area that can fit a maximum of 30 vehicles (currently holds 3 APCs and personal vehicles for the team members). Includes a full repair bay and car lift for those who like to work on the vehicles. 25: The Omegas war room. Large Citynet display screen with massive computer systems. Two smaller two man computer terminals on either side. Two full holographic displays are located on either side of the Large Citynet display screen. This room is encoded so only the team leaders and their seconds in command have access. Also contains a small medbay. 26: This is a public conference room should the Omegas need to make a statement to the Media, Mayor, etc etc. 27: A full sized armory including extra weapons, explosives, Omega Suits, ammunition, and all the other items that may be needed but kept under lock and key. A full high-tech workbench is located inside with a full cabinet of components for crafting. There is a secret exit in the armory. The ceiling irises open allowing the Baron to fly out. 28: Security room for the Armory. The armor itself is a sealed vault requiring a retinal scan to be used to gain access. 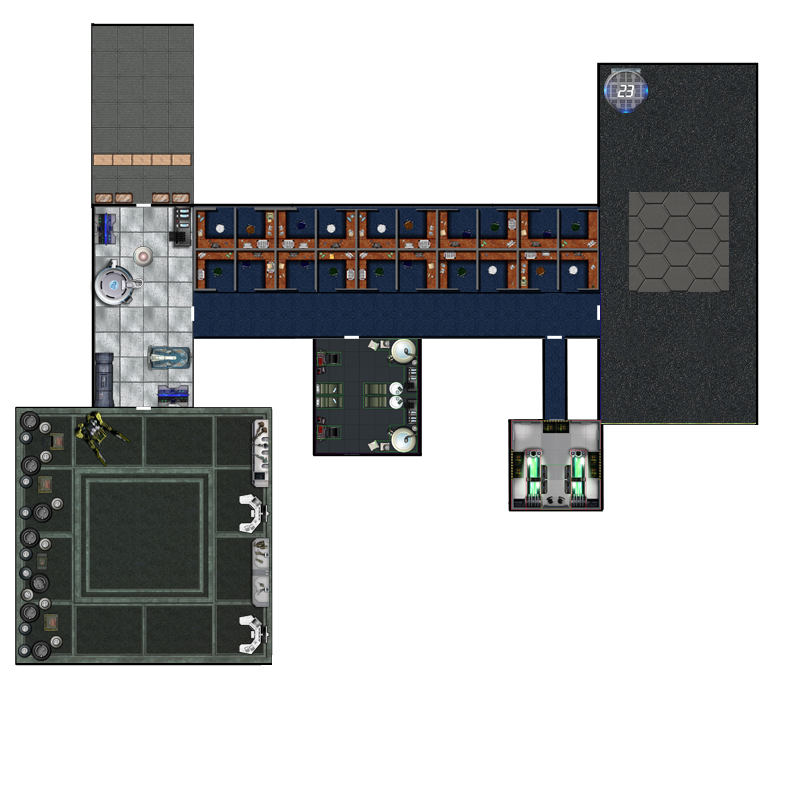 The security room itself has monitors for the entire Omega base (not including the bedrooms) and security programs controlling the automated defenses outside the building. 29: A full pantry/Larder. Stocked with a good ammount of food and full wine racks. 30: A massive dining room with three tables for the three teams of the Omegas. 31: A fully stocked kitchen and laundry facility. 32: The Common Room: 4 skeeball game machines. 2 classic arcade game machines. 3 Massive citynet terminals. A large, all-purpose confrence table with chairs. A fully stocked bar. Fully stocked bookshelves. A large citynet monitor. A couch and five chairs. And even a fully stocked coke machine. This room is where the Omegas live when they are not fighting crime or Sleeping. Enjoy the room. Surrounding the base is a massive two foot thick wall made of reinforced concrete standing ten feet high. Security cameras are posted every fifty feet and motion sensor lights every 75. Scanners are posted every 150 feet around the outside of the base that are linked to the security computers, allowing the automated defenses to automatically defend the base against hostile attacks on the base. Retinal Scanners located at the main gate to the grounds, armory and security room, war room, and garage. Bio scanners at the entrances of the building keyed to the Omegas. Lesser M.D.C. Beings: 1:1 conversion for beings of 120 or less M.D.C. Greater M.D.C. Beings: 30% become H.P., 50% become S.D.C. Alien Intelligences, Demon Lords & Similar: 10% become H.P., 30% become S.D.C. "Radio communication is posted like this." "Strictly verbal communication is posted like this." Telepathy is posted like this. Thoughts are posted like this. Please note the placement location of the quote symbols when used. A/GM ratings will begin on the 1st of February. IIRC, this is also when A/GMs get XP tallied. This list is not comprehensive. I will add approved Rifter O.C.C. 's and other specific material to this list on a case-by-case basis as such is proposed through the regular submission process. Classes should be inquired after during your chat with Blackhaunt regarding your character concept, and other Rifter material should be explicitly inquired after in your submission. Please note that "explicitly" means you must directly inquire whether something is permissible. If you leave it up to me to infer such a request, I will simply deny that request. Occasionally, I will also add approved Rifter material to this list on a case-by-case basis as such matters come up in the course of gameplay. Inherent Supernatural Strength allows for bonuses from Physical Skills. Supernatural Strength (the power) does not. If your character class grants you Supernatural P.S., you may gain P.S. bonuses from Physical Skills. If you roll Supernatural Strength as a power during Character Generation, you may gain P.S. bonuses from Physical Skills. If you purchase via EP (rolling or selecting) Supernatural Strength as a power, you may not gain P.S. bonuses from Physical Skills. Ma'am, you may recall one of my earlier assessments on magic in Century City as being rarer and on the lower end of concern compared to the more prevelioant super powers. I new development has been made. 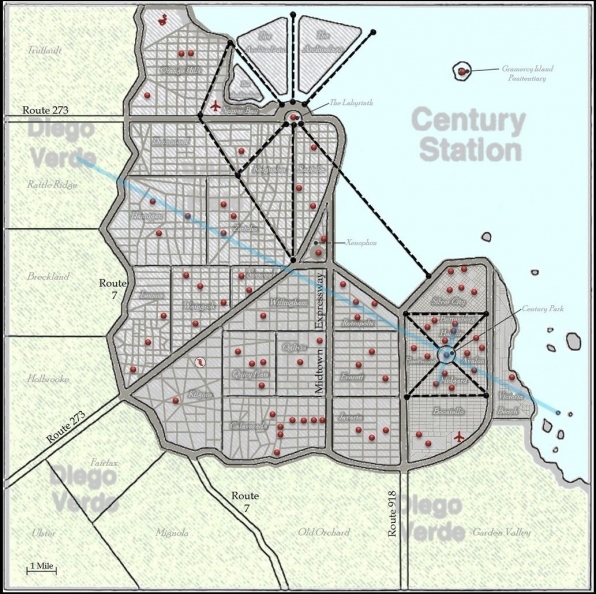 Two ley lines were discovered in our research. Furthermore they converge into a nexus over our very own CENTURIONS HQ in Century Park and the Ley Line to the Northwest crosses over the OMEGAS HQ in Retropolis. I have yet to determine an explanation on were they came from or if they have just eluded detection for this long. Obfuscation of the magic lines has not been ruled out either. The effects they have on magic are several miles around the nexus and near the lines. I have attached a map outlining the basic locations until further refinement can be determined. If this is a new occurrence we can expect it to draw others sensitive to magic. If it was hidden then I suspect that surveillance of individuals coming within the Century Park square would be gainful in finding these other hidden wizards. Further investigation is in progress and will be reported as it develops. Personal note: This is absolutely exciting from my position as a Mystic. What could this mean?